Before he started building looms and weaving, Jim Ahrens was originally a cabinet maker, mechanical engineer and machine designer. He forayed into the world of textiles first as a hobby weaver and loom builder; later ran a weaving studio and weaving equipment business. He became a prolific production weaver and inventor of many tools that make a weaver’s life easier. 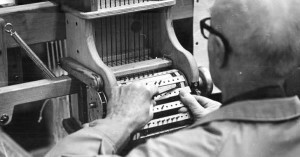 He went on to become one of the founders of AVL Looms, where they still use his designs and inventions today to make world class weaving tools. The pre-AVL looms he built between 1938 and the late 1970s are known today as Ahrens Looms, historic and functional pieces that delight many weavers today with their unique and ergonomic features. We dedicate this website to helping weavers use these wonderful old looms to their full potential so they may bring many more hours of fun weaving in the future. Jim and his first wife, Dorothy were visited by Dorothy’s grandmother in 1937. She signed up for a weaving class, but her first project turned out to be more of a tangle than she was prepared to tackle by herself. Jim, well versed mechanical engineering and solving machine-related problems by then, offered to help her out. He knew about machines but had never looked into weaving before. To educate himself about the process, he checked out a few books from the library, and one of the books he came across was Luther Hooper’s Handloom Weaving. He was so captivated by the problem of weaving that he designed a loom for his wife’s grandma, and eventually started weaving himself. He continually made improvements to the design of other equipment as well, tweaking warping reels, shuttles, heck blocks and others so they work better, faster, more precisely and are easier to use. His inventive process centered on finding design solutions to small (and sometimes big) practical problems that can make hand weaving exhausting, frustrating, back ache-inducing, needlessly time consuming. He strove to make better equipment that poses fewer limits on the weaver’s imagination. He started studying and creating dobby looms when Dorothy once brought home an intricate piece of linen she wanted to replicate. They figured it would take 36 shafts to weave the pattern, so he added 4 more for the selvedges, and set out to build his first 40-shaft dobby loom. Patterns are often defined by how many shafts are needed to weave them, but according to Jim, the real limits of a loom are the number of its treadles. 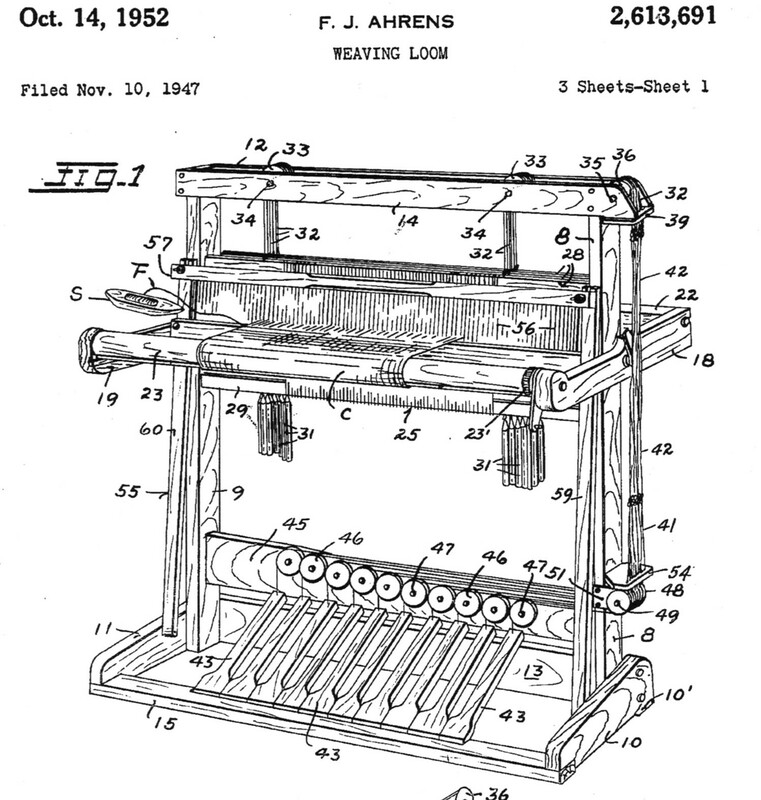 A 4-shaft loom using direct tie-up can raise its shafts in all possible combinations with just 4 treadles, but a 6-shaft loom can make 50 different sheds, while a 16-shaft one can produce 65 000 (!) combinations. So he looked to old, 18th century designs of drawlooms and heir 19th century variations, the dobby looms. He tweaked their designs to make use of newer, more durable nylon cords that were not available in the 19th century, to link the dobby chain to make a quieter, lighter, more weaver-friendly loom for complex patterns. 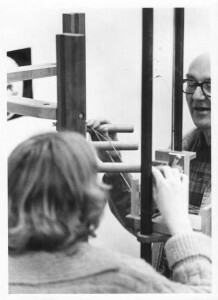 Efficient and fun weaving was a high priority for Jim Ahrens. He knew that if a project goes too slow or takes too long to complete, even the most dedicated hobby weaver can get discouraged. So he did thorough time studies on various people weaving to find out how long it took them to weave a yard of fabric and why; and used those observations to find the problem points of weaving technique and loom design to prevent getting overly tired and giving up before the loom is ready. One particular problem for many weavers is that jack looms need heavy frames on each shaft, so when the other shafts are lifted, the rest are held down by their weight and do not float up to disturb the clean shed. On the down side, these heavy shafts require a lot of force to lift, and on wider looms with many shafts it puts a serious strain on the weaver’s legs and lower back. 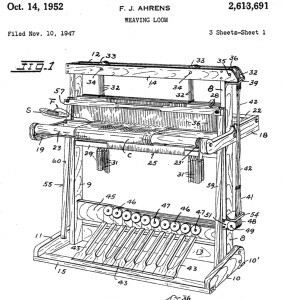 Ahrens got rid of the weighty wood frames and noisy metal heddles on his looms and designed a system of springs that stretch easily when shafts are lifted, but firmly hold them down when they need to stay down. H e saw that many weavers dreaded changing the tie-up on their looms and designed several projects that use the same tie-up rather than crawl under the loom to work on a potentially lengthy task in a tight space and in an uncomfortable position. He used a system of pulleys above the treadles and moved the tie-up to the side of the loom where it’s easily accessed and can be modified even in the middle of a project! At the time, many weavers wove on looms that had the beater’s shuttle race half an inch below the height of the warp. When the shuttle is thrown, it’s only the warp thread that can support it. He wanted some extra support so he can handle his shuttle with more confidence and fewer errors, so he modified his looms to make sure the warp threads exited the reed dents exactly at the right height to rest on the shuttle race, in fact many Ahrens looms have adjustable warp height. On many jack looms, the warp threads run in a straight horizontal from the back beam, where a ratchet rigidly holds the beam from rolling forward, through the heddles and the beater to the breast beam. When a shed is opened, the warp threads are stretched to travel a longer path: up at the heddles, then down to the breast beam. This can lead to broken warp threads and more strain on the weaver’s body, but Ahrens’s Automatic Tensioning System keeps the warp threads taut more dynamically: they both sink a bit when not lifted and rise when lifted, and unwind a fraction of an inch to make room for the extra length required by the open shed. Jim Ahrens and Dorothy maintained a vibrant weaving and teaching studio when one day, suddenly, as he remembers, the students and weavers just stopped coming. No one showed up, no phone calls, the business went cold. Jim thought it was the start of daytime television that put an end to the hobby that kept many women creatively engaged once the day’s chores were done. Turning a problem into a solution, he turned from teaching and equipment to production weaving yards and yards of fabric for decorators. 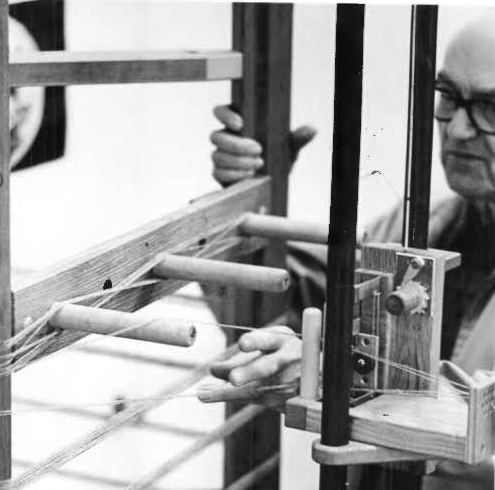 Later, he did textile research for the Department of Agriculture and he taught production weaving at Pacific Basin Textile Arts, a school owned by Pat McGaw and Inger Jensen. Here he met the cabinet maker Jon Violette, Pat’s brother in the late 70s. They together started a business that later became AVL Looms which still builds and services looms that use his inventions. Jim Ahrens died in December 2000, and left behind a legacy of ingenious, hands-on inventions that solve practical problems of an active hand weaver. A woodworker, machine designer, teacher, hand weaver, production weaver, and interdisciplinary problem solver, Jim Ahrens was not tied down to one specialty, but let his expertise in one area feed his innovations in others wherever he went. When he was young, he once worked as a ship’s radio operator and learned Morse code. After using the ship’s equipment for a while, he took it on himself to redesign the ship’s sending key and receiver. He always improved the tools he worked with to get a better job done, and a better work experience. All of us who use AVL looms are the beneficiaries of Jim Ahrens’s creative problem solving. All of us who can get their hands on the looms he made pre-AVL can continue to cherish the legacy of an interdisciplinary thinker with the unbridled tinkerer spirit by learning to use these antique tools to their full potential. 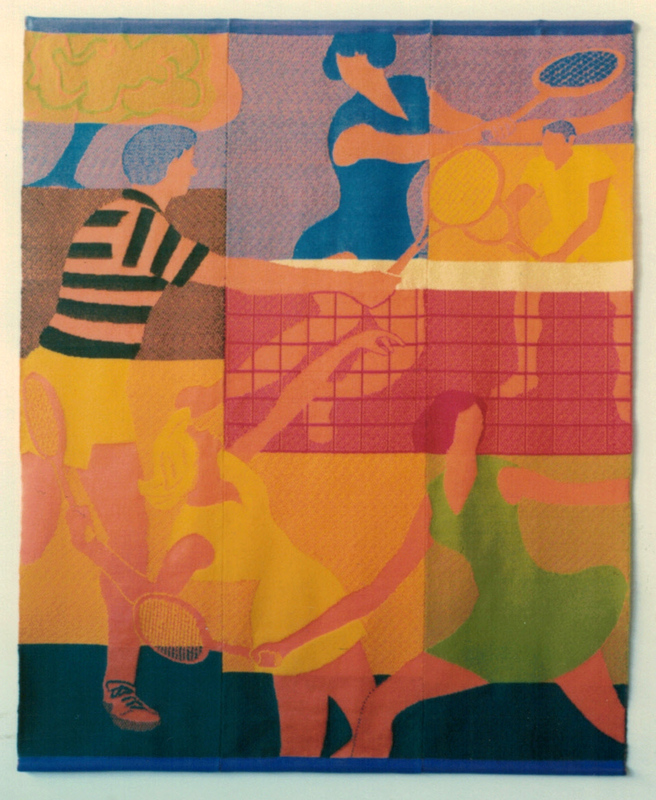 Pictorial damask hanging woven for the Courtside Tennis Club, Los Gatos, California, based on Pat McGaw’s husband Bruce’s painting. Pat dyed all the wool weft yarns to match the painting, joined the pieces together and did all the finishing. Ahrens, Jim. “The End-Feed Shuttle.” Weaver’s. 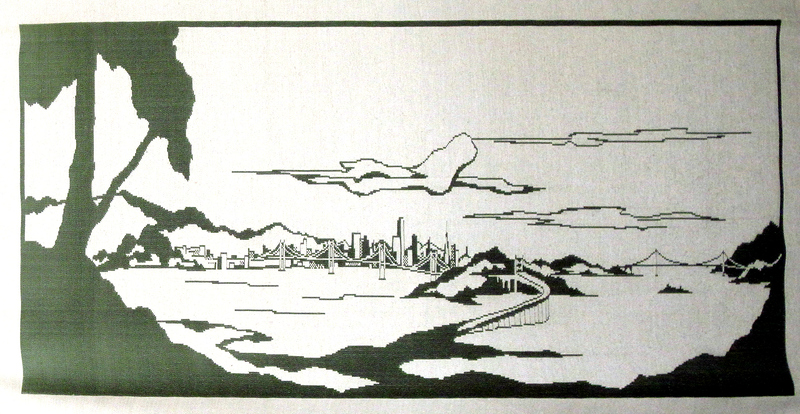 Issue 6, Summer 1989. 54-55. Ahrens, Jim. “All About Warping.” Weaver’s. Issue 7. Fall 1989. 20-22. Ahrens, Jim. “Weaver’s engineer: A Bobbin-Winding Guide for End-Delivery Shuttles.” Weaver’s. Issue 9 – 2nd Quarter, 1990. 48-49. Alderman, Sharon. “Jim Ahrens: 1906 – 2000.” Handwoven. Issue 104, March/April 2001. 12. “Damask Gallery: Meet contemporary Damask Weavers.” Weaver’s. Issue 4. Winter 1989 33-34. Kohl, Judith, “Pacific Basin School of Textile Arts.” Textile Artists’ Newsletter. Winter 1978. Xenakis, Alexis. 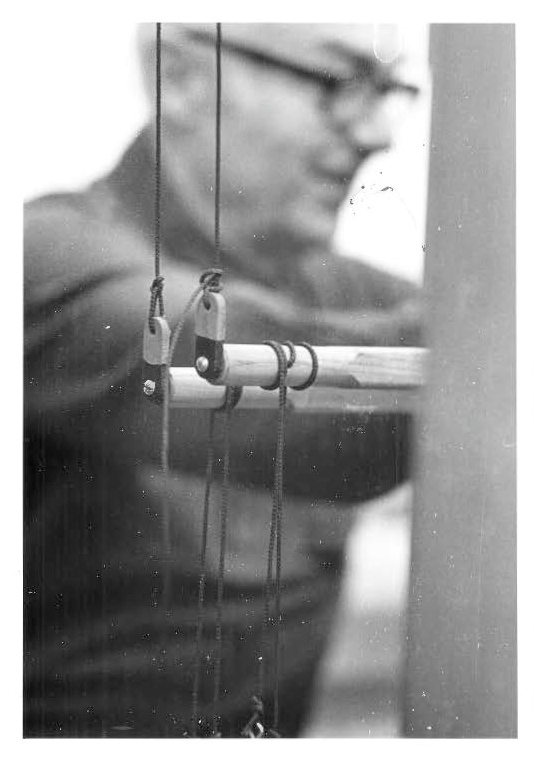 “Jim ‘The Legend’ Ahrens: Common Sense Engineering, Uncommon Looms.” The Prairie Wool Companion. Issue 14, 6-13. Thank you for this, Peggy. My husband bought me an AVL loom 32 years ago, #315. It is a beautiful piece of art in and of itself. Why he bought me a production loom I didn’t know as when he did it I had not even taken my first class. But my husband values craftsmanship and my AVL certainly has that. I love weaving on it!